This month the Rainbow Scrap Challenge is working on Teal, Aqua or Turquoise scraps, really anything that is not really blue or green but some were in between. I love these colours. I first worked on the Aqua green scraps and then did lime green because these two colours share the same little box. I also got behind with my green from the month of April. I call these Coin Strips. I hope to do more this month on them. I need to get the Blue done from May. I have added today's post to the linky party over at Soscrappy. Next is a few spools. Really only the last one could be called Turquoise, the rest are more Blue. Here I have 9 Slab blocks done for Cheryl over at Dining Room Empire. She is putting together quilts for the flood victims in Southern Alberta. I did my yellow ones at the very end of June. Then I did some blue ones and made sure there was a touch of Turquoise in there. 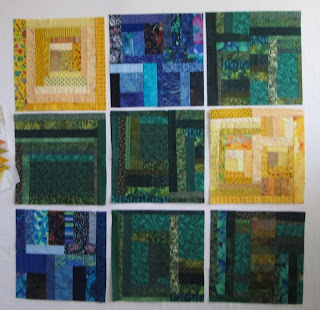 Next I got out some green Poverty Piecing I had done years ago and got 5 green slabs out of it. All of the slab blocks are 15.5" square. These 9 fill my design wall. I have to get them in the mail, her deadline is the end of July. So far 5 yellow Hexie flowers done from June. 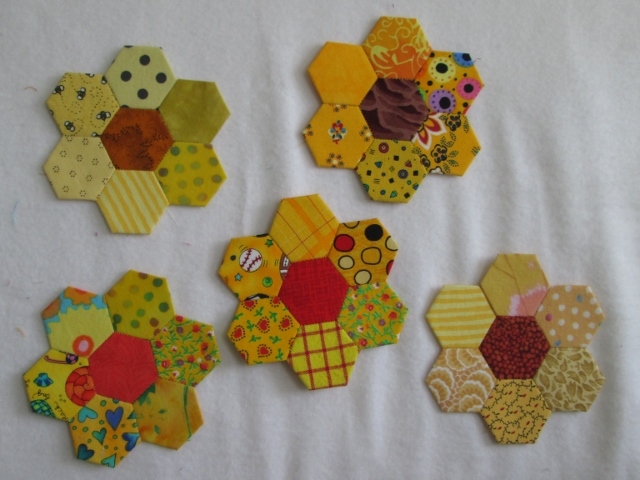 I had prepared all the yellow hexagons but did not get the hand sewing done. Next what I have been up to? I spent a few days sorting fabric and trying to clean up my room a little. It always looks messier before it is cleaner. I am not done yet. Also I have spent tons of time outside playing with my horse and dog. Three days this week were clinics, 2 horse days and an agility clinic yesterday. Summer is great. More beautiful coin strips and spools. Love the slab blocks. Such a worthy cause. Your spool blocks are adorable. I think look like mini bow ties. Great slab blocks for a great cause. I love your hexies. Hexies are still on my someday list. Your strips are really beautiful! Such lovely vibrant colours. 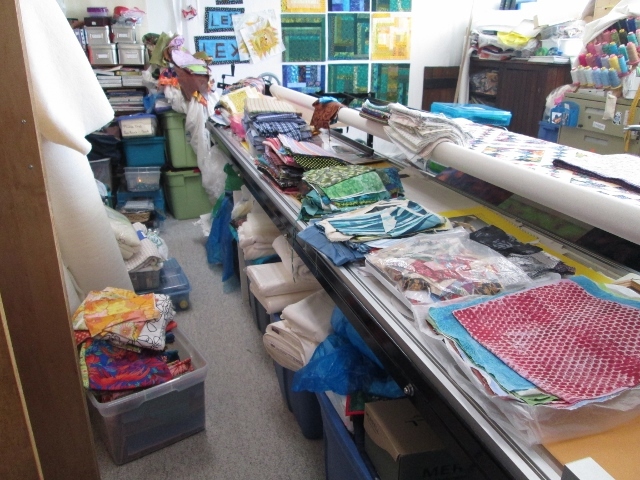 and your sewing room is enormous, I have serious sewing room jealousy right now! 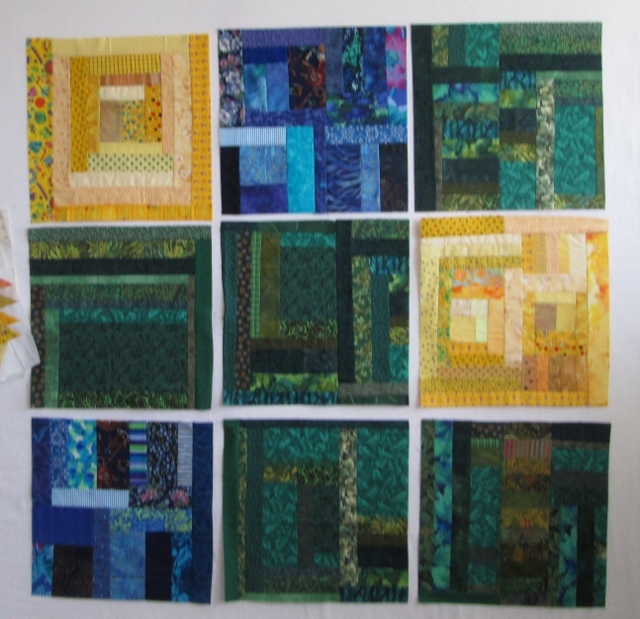 Your slab blocks look great, Cathy...and I'm lovin' your hexies, even if I'm not a fan of bright yellow. They just look so cheery. 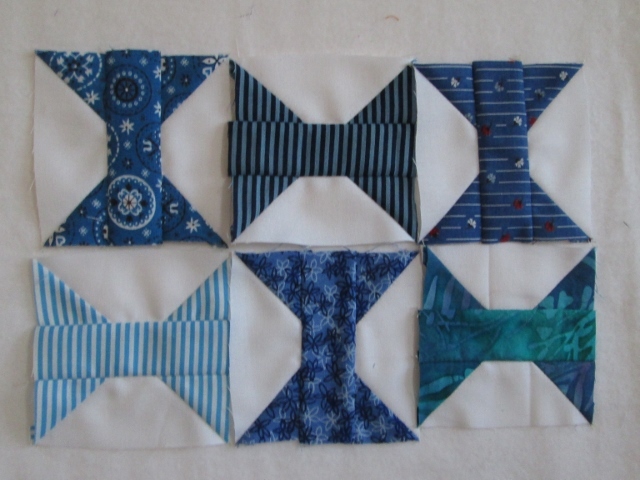 Sorry I have forgotten to get back to you on the OB quilting...it got lost in the shuffle. Soon! What fun is going on in your sewing room! It's a scrap party! Love all your scrap projects! Can't wait to see how the slab quilts turn out! Love the coin strips. Such pretty, cool colors. What a bunch of scrappy goodness! And I'm jealous of the size of your sewing room! 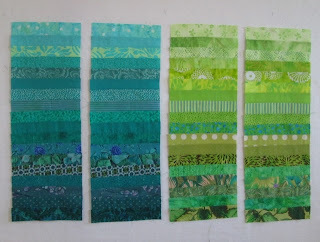 Love the aqua and the lime green together they are so striking and so pretty! 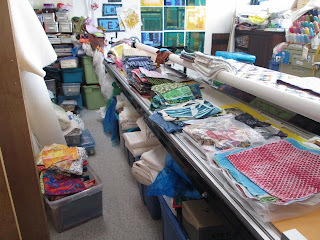 Your sewing room looks wonderful to me - you have a fabulous space filled with tons of goodies! !